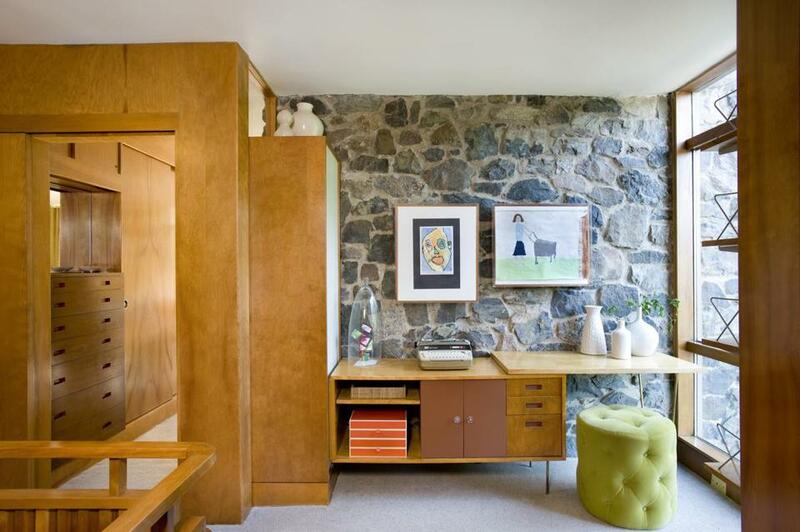 The built-in is original to this 1949 Newton home by local architect Samuel Glaser. Interior designer Diane Burcz purchased the home six years ago. It came with the original blueprints,which detail the built-ins throughout thehouse. Stone adds a lot of texture but can be dreary, especially when it’s north-facing. Burcz recommends adding a pop of color that might be too intense to use elsewhere in the house. The ottoman (Mitchell Gold + Bob Williams’s “Rocco” in citrine velvet) adds comfort and brightness without blocking the horizontal line of the desk, she said. Inexpensive white ceramic vases from Target stand up to stone without competing with other elements, and colorful boxes from The Container Store supplement drawers housing photos, making them easy for the family to access and enjoy.